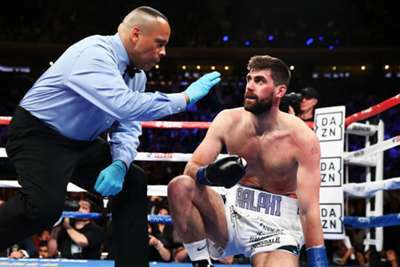 Rocky Fielding congratulated Saul 'Canelo' Alvarez on his devastating third-round TKO but the Englishman insisted he "lived a dream" at Madison Square Garden. Fielding lost his WBA 'regular' super-middleweight belt as Alvarez became a three-weight world champion via knockout in front of 20,011 fans on Saturday. Alvarez (51-1-2) overpowered and outclassed Fielding en route to a merciless victory in New York, where the big-hitting Mexican dropped his opponent on four occasions, including twice in the third round. Fielding (27-2) was unable to cope with Alvarez's body shots and speaking via DAZN afterwards, the 31-year-old said: "Canelo is an elite fighter, and I never shied away from a challenge. "It was a great week, met some great people. I lived a dream. Hats off to Canelo. I respect him." "He's strong. I was catching some shots, but he kept coming forward," Fielding added. "The body shots were really tough. "He placed his shots well, and he caught me. I stood there too long and tried to mix with him. I gave it everything, and the better man won."